Movie Review: The Book of Eli- A Stylish and Engaging Post-Apocalyptic Action Film That Neglects Subtlety | Generation Film! It seems as though the apocalypse is on every filmmaker’s mind considering all of the releases of 2009, including The Road, 2012, and Shane Acker’s 9, as well as three in the first month of January alone that all deal with the vast subject matter of the end of human civilization. While some are forceful and others are just plain ridiculous and lack foresight, it seems as though the Hughes Brothers have learned a thing or two on how to not be predictable. Known for their passionate and well thought out films such as Menace II Society and Dead Presidents, the Hughes Brothers could never be labeled typical Hollywood filmmakers and their new project The Book of Eli is a stylish and interesting tale amidst the tired and seemingly overused backdrop of the apocalypse. Focusing on the controversial topic of religion and how one believes in its power to save the soul while the other believes in its power to control, The Book of Eli allows for an intriguing Road Warrior-esque western that makes for an entertaining action film that stylizes its violence in a visually unique way despite the last incredibly slow 20 minutes. With a twist that isn’t too surprising for those paying attention the film doesn’t border the un-interesting and remains consistent with the slightly above average quality the Hughes Brothers are known for producing. Much in the same vein as The Road the apocalypse in question for The Book of Eli isn’t overtly discussed and is only slightly alluded to as a by-product of a large scale war such as a World War III. Our protagonist is a wandering “walker” known only as Eli, played subtly well by the usual over the top Denzel Washington, who is heading west because a voice has told him he must as he carries a book along with a shotgun, machete, and bow and arrows. If Eli is threatened by others his victim’s fate is a product of a typical western fashion where one must beware of the man who doesn’t flaunt his weapon handling abilities with the weapon usually used in the film being the machete. Eli’s journey gets complicated after he ventures into a town run by a well read intellectual named Carnegie played effectively by veteran actor Gary Oldman. Carnegie at first wants Eli in his employ after witnessing Eli’s defense abilities against Carnegie’s thugs. However, once Carnegie finds out Eli possesses a copy of the Bible he decides to eliminate Eli for Carnegie wants to use the Bible as a tool to control the weak and dim-witted. This struggle for power is quite common but Oldman handles the potential cliché quite well and makes it a gripping performance that is believable. The story isn’t necessarily original but the stylistic choices aid the typical apocalypse narrative into becoming something a bit more especially in regards to the survival of religion. While the film never truly takes a stance as to why religion must be saved, perhaps morality for the barbaric survivors or a reminder to battle the evil of human nature, it remains a guiding force for the story to remain relevant as each plot sequence and twist unfolds. The layering dynamics in The Book of Eli wouldn’t have been so potent if the Hughes Brothers were amateur directors but they have been around a while now and have finessed their talents. Film after film their technical abilities have gotten stronger and their great use of the digital red camera here brings about a unique and gritty atmosphere that hints at The Road while remaining slightly different. 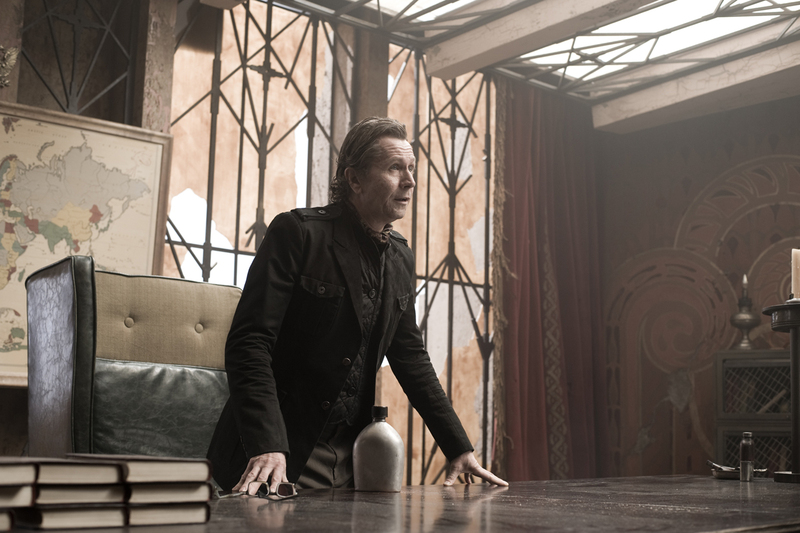 All of the actors, from Gary Oldman to Tom Waits as the town’s trading engineer, feel as though they aren’t pressured to deliver a dictated parameter of emotions but venture into their own creative expression rather well. The bottom line in any Hughes Brothers film has always been story and how to expand upon the narrative with experimental uses of technique and The Book of Eli doesn’t disappoint in this respect. While this stories progression unfortunately hits a speed bump as soon as the moment of realization occurs making the last 20 minutes seem unnecessarily exhausting the film remains interesting and forces you to think back on the hints and visual aids on the twist. As an action film The Book of Eli doesn’t disappoint and has some incredibly interesting stylistic fights silhouetted in shadow or following an arrow or missile from origin to impact. However, the film also transcends just being an action flick set in a post-apocalyptic environment due to its consistent and dedicated exploration on the survival of religion, a representation of morals versus manipulation. Due to the unfortunate trend of apocalypse films being released The Book of Eli will be unfairly compared to its predecessor The Road. The Road didn’t blatantly list religion as a source of survival but did so allegorically through the innocence and moral preservation in a child. The Hughes Brothers’ film doesn’t approach the same idea with subtly or imagination but rather as a sub-point to their intended action adventure. 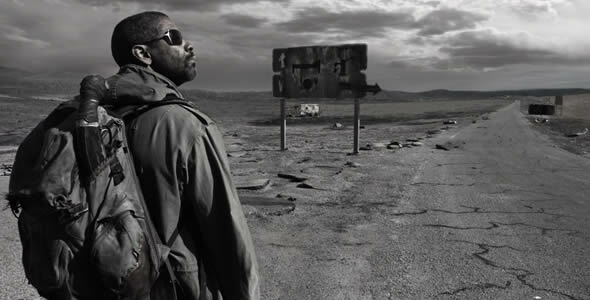 The two are incomparable despite their similarities in appearance and narrative backdrop because they just possess too different qualities, such as The Road’s focus on the relationship between father and son while The Book of Eli wishes to comment on the idea of personal obligation and religious faith. Its difficult to go into a film with a blank slate especially after the non-stop post-apocalyptic films being released in Hollywood, Daybreakers just being one last week (Legion comes out next week). However, the style and technique that accentuates the Hughes Brothers’ story puts a unique touch on this overly done narrative backdrop and is well worth experiencing despite its anti-climactic conclusion. Many people will enjoy it for its action sequences and some others will find the religious undertones rather interesting but nonetheless The Book of Eli isn’t your ordinary post-apocalyptic film. The Hughes Brothers have come a long way from their riveting film Menace II Society and it shows throughout their new film The Book of Eli. Their style is incredibly recognizable, their dedication to story at the core of their films is obvious, and their delivery for action isn’t corny or overly done. The use of the new red digital camera makes for an interesting visual experience amidst the gritty wasteland making beautiful pictures out of ugly environments. Most January films are usually a dump off point for studios unmarketable films but this isn’t the case for The Book of Eli, which demonstrates these two Detroit filmmaker’s strengths for guiding actors, telling stories, and utilizing interesting visual technique. Don’t be turned off by the fact that this is a post-apocalyptic film because it plays out more like a western, more Road Warrior than Blade Runner, which makes it an entertaining and visual experience rather than a cerebral one working in favor of these two directors’ repertoire.